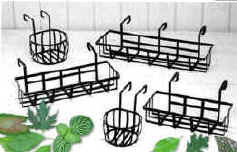 Fulton Square Deluxe hanging baskets, wire baskets, and gift baskets have a full, rich appearance. Strong steel strips gracefully form the baskets with a textured black, or white finish that provides years of carefree use. These gift baskets provide a unique design to allow you to create beautiful, lush floral displays anywhere, Indoor or Outdoor. Metal hanging basket with hangers. Inside and Outside corner baskets. Our Deck Mounted baskets allow you to display your floral creations in areas you couldn't before. No Assembly or screwing required, simply hang the basket over your deck railing. Available for a variety of different deck railing sizes. Fulton Square gift baskets provide an elegant display for your decorative items. You will find multiple uses for this practical , good looking basket set throughout your home. Fulton Squares Extension hooks are used to hang baskets, signs, birdfeeders, or lanterns. Made of the highest quality steel and powder coated to protect them from the weather. Replacement Coco liners for Fulton Square round and square Baskets. Also for Your our designs.